I introduce you a new Gallery that I will be updating on a regular basis with the drawings and illustrations posted in the members-locked section CLAMP Graffiti of CLAMP-NET.COM. All drawings were taken from Tsubaki Nekoi’s board, but in case any of the other 3 post illustrations, I will add them as well. I have created a Picasa album where I will be adding the new pictures in batches. For Facebook users, I have created a Facebook Page where you can check new updates from my LiveJournal in your Facebook news feed by becoming a fan. 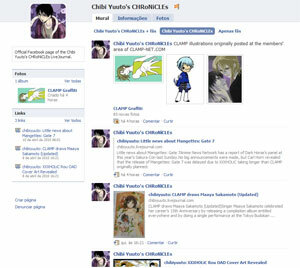 I have created the same CLAMP Graffiti gallery on the Facebook Page, this way you will also know whenever the gallery is updated with new pictures if you become a fan. And although this isn’t new, it’s worth mentioning that you can also follow this LiveJournal on Twitter. 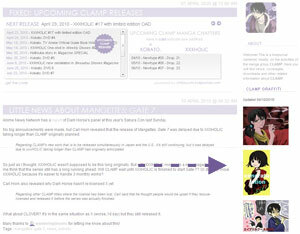 These new features were added to provide you the latest CLAMP news in a fast and comfortable way for all of you. That is my compromise XD Thank you for visiting my LiveJournal! Awesome, thank you so much! She’s been making so many Legal Drug pictures, haha. Also, that Himawari/Kohane picture is absolutely adorable. Lots of new features! Seems like a lot of work, so thanks for thinking in more possibilities for CLAMP news sharing! Just kidding 😛 I'm very grateful for all the efforts you put in sharing clamp news with all the online community worldwide, I'm not exaggerating saying we would be lost without you! I was going to answer you on twitter but I prefer here, like in the old times. Also a FB page!, that will be a good reason to use more frequently my account and not only as a “you have to do account” ^^U (love my university’s friends for remember me all that XD). LOL XD Yeah but on Twitter it would be something like “Hey U, Congratulations ♥♥♥♥♥!! !” xD but this time I needed more space to write, so LJ is always the best. *Hugs you back* Also is good to hear it, always improving for the sake of everyone, and you already know that I’ll support and follow you until the end (no kidding). Thank you so much for the update!!!!!!! This is amazing ;u; Thank you so very much!! fdhfkfj the baby Wata & baby Syao pic gjdjkfdk ♥♥♥! HAHAHAHA one service at a time, one service at a time. Like I joked in Twitter/FB, soon I’ll be offering Mobile updates XDD (NOT HAPPENING ANYTIME SOON). the pictures are beautiful,thanks a lot for this !! Huzzah for the personal board posts! Thank you. I spazzed at seeing this facebook group and then the gallery. So much Legal Drug. It made me happy. So very happy. Why Mr Alex, you shall become my husband. *after looking through pctures* Wow, Nekoi style improved so much! I love all the Lawful Drug images (isn’t that Nayuki from third volume?). Pumpkin-pants pics are so cuute! Thank you very much, that really made my (very depressing for my country) day. But just so you know, Nekoi didn’t say anything about being Nayuki. Most of her drawings are not related to the subject. She would write about mushrooms and post a GD picture, or gym classes and post a Watanuki picture. Most of the time picture and text don’t match (but sometimes they do, like the Maaya Sakamoto picture on her birthday). Your new layout is so pretty~ *drools* Even if I’m not a fan of purple. I expected to see pics about Watanuki and Himawari, or Watanuki and Yuuko in her board but all I can see is Watanuki and Doumeki. Either a) Fanbait b) Nekoi supports them, c) Might hint to future events or d) They just look cute and funny, while WatanukixHimawari and YuukoxWatanuki might look too angsty. Lol, love the Watanuki pic. He looks so… manly? The new layout is elegant – the choice of violet and the repeating print looks very… mature. It’s very suitable for Watanuki!